This week’s aquarium care tip is going to focus on one of the most frustrating issues when owning an aquarium- Algae. Running an aquarium maintenance service business, we get asked a lot of questions regarding algae. Most commonly, “is algae dangerous to my fish?” and, “what causes algae?” While we will get into the details of its causes in the tips below, we would like to squash one myth right off the bat- MOST ALGAE IS NOT DANGEROUS TO FISH. 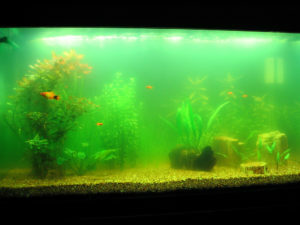 In fact, while very unsightly, algae actually does many beneficial things inside of aquariums. Its benefits include: providing food to certain fish, providing oxygen to the tank, and removing unwanted organics (waste) from the water. That being said, nobody wants to see a glowing glass box of GREEN! The importance of regular water changes cannot be stated enough. Food and fish waste builds up between water changes most of which ends up in either your filter or your gravel. This waste ultimately ends up as Nitrate, and Nitrate is a prime food source for alage. This is why changing 25-40 percent of your water on at least once a month is so important. When changing your water, you should not just remove the water. Instead, purchase a gravel vacuum from a local pet store which will allow you to simultaneously remove water as well as the waste hidden in the gravel. A common misconception is that a filter removes waste from your system. This is not the truth. In actuality, filters grab and hold waste. Any waste a filter grabs is still in the system until the filter is cleaned out. Just like the waste in the gravel, this waste is turning into nitrates and nitrate is feeding algae. Most filter material can be rinsed clean a couple times before needing to be replaced. Change or rinse your filter material ideally once a week, but if that is not practical for you, make sure to do It after performing your water change. Like Nitrate, phosphate is another major food source for algae. Phosphate generally enters a tank from one of two sources. Either it comes in from your tap water, or from food. Most flake and pellet foods contain high levels of phosphate. Any uneaten food will release phosphate into your aquarium. If your tap water is the problem, consider purchasing a reverse osmosis filtration system. A small unit can be purchased at your local fish store at a very reasonable price. If you happen to have a lot of fish, or are unable to purchase a reverse osmosis system, use Granular Ferric Oxide or GFO. GFO removes phosphate from water and can be purchased at your local pet store and added to your filter in a mesh filter bag. We often use GFO in tanks with very bad algae issues and the results can be amazing. The general rule with feeding is to feed once a day. Judge the amount by feeding a small amount at a time. If after two minutes, you still see uneaten food floating around, you have overfed. Net this uneaten food out, and reduce the amount on your next feeding. Pretty soon, you will know just the right amount to add every time. Without light, algae cannot grow. Unfortunately, people want to see their fish so nixing the light is usually not the solution. That being said, very often people new to the hobby will run their lights a lot more than they should. Lights should be turned on no more than 8 hours a day, preferably less. An easy solution to controlling the amount of light is to purchase an inexpensive timer from your local hardware store. Set the time you want the lights to turn on an off and you are good to go. We usually recommend to our clients that they keep the lights off when they are at work and have them set to come on around the time they will be home. This limits the amount of light during the day and can drastically reduce the amount of algae between service visits. Bulb choice also matters. Choose lights that are bluer, rather than yellow, as algae prefers to use light in the yellow spectrum to grow. Look for lights that say 50/50 or 20k. Also, change your bulbs once a year. Algae can be frustrating, but with a little knowledge under your belt and the willingness to do a little work, it should never be an issue. We hope that you have enjoyed this week’s Aquarium Care Tip!